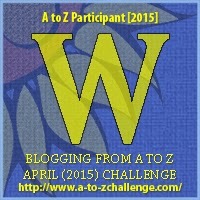 The day before writing this, my husband and I were in the Addo National Park. It was clearly baby season in the warthog family, and it was no surprise to learn that the Warthog is one of the least endangered species of African animals. 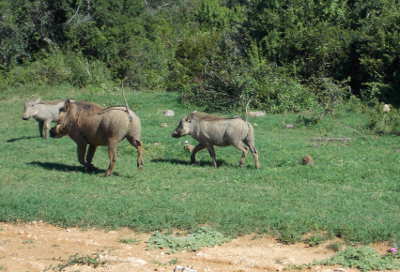 Everywhere we looked, we spotted warthogs and their offspring grazing alongside elephants, buck, and other animals. These wild pigs live in the savanna regions of Africa, mainly south of the Sahara, and can survive for months without water. They live in family groups comprising a female and her young. A second female and her young will sometimes join the group. The males usually live alone, only getting together with a group when he wishes to mate. Their greatest dangers in the wild come from lions and leopards. When in danger of attack, they either flee or they slide backwards into a hole, using their formidable tusks in defense. 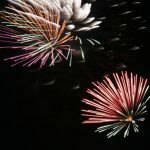 When they run, they hold their long thin tails, which end in a tuft, upright so they look like flags waving in the breeze. 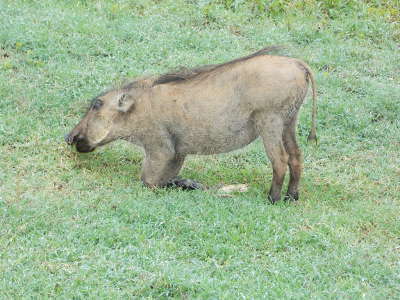 Man is another of their main predators as warthogs raid agricultural areas for food. They also have the potential to carry African Swine Fever, so men often kill them when they invade their farms. The males weigh from 9–23 kgs (20-50 lbs) more than the females. Both sexes have disproportionately large heads with three pairs of warts in the case of the male, and usually two pairs in the female. 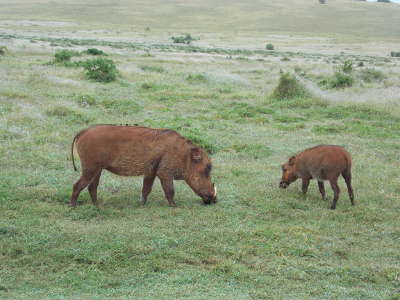 Despite having poor sight, their highly-set eyes allow warthogs to watch out for predators even when grazing. They have a strong sense of hearing and smell. They are capable of speeds up to 55 kph (34 mph), and their tusks can grow to 25 cms (10 inches) in length. Warthogs mainly graze short grass, and they have a fascinating habit of kneeling on their padded knees, as can clearly be seen in this photo of a baby enjoying his grass meal. 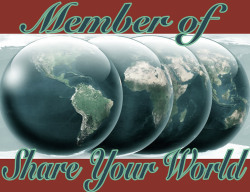 They live in holes normally excavated by other animals. Warthogs occasionally engage in duels which can be bloody and aggressive, smashing their heads together in an alarming display of force. Although they are basically herbivores, they are also scavengers. So if they come across an abandoned carcas they will stick in and enjoy a meal of raw meat. When there is water available, the warthog drinks regularly, and in common with Queen Cleopatra of old, he loves his mud bath. 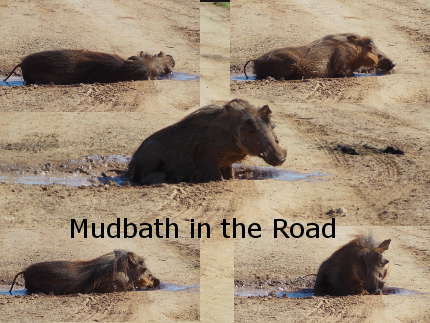 In our recent trip to Addo, we sat in the car and watched (and photographed) a warthog having a wonderful time wallowing in a puddle of muddy water right in the middle of the road in front of our car. As soon as he finished, he trotted over to his mate and after a brief “conversation” she headed for the same puddle and repeated the ritual. It was a real “African moment” for us to enjoy. 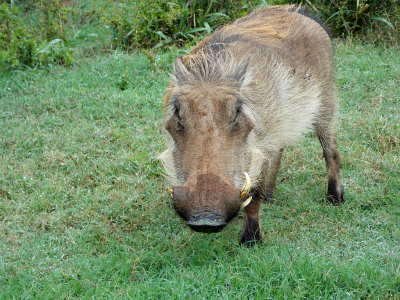 Warthogs are ugly, fierce-looking creatures who are not at all graceful. Yet, there is something cute about their cartoon-like features, their springy run, and of course their adorable babies. They bring entertainment and lots of activity to the African bushveld, and they are well tolerated by many other animals. And of course, Pumbaa is a favourite character in Disney’s Lion King.